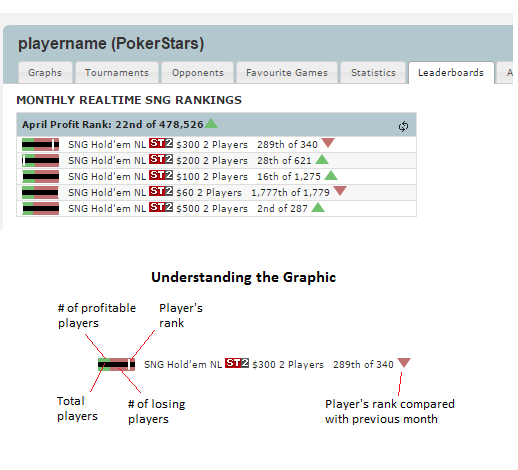 SharkScope has always delivered the most comprehensive yearly leaderboards in online poker, updating thousands of top players by various stake ranges and game types on a daily basis. However, SharkScope is now releasing a new leaderboard system that can do more. More details. Faster updates. More comprehensive rankings. Today we launch our real-time monthly rankings that expand to all tournament types covered by SharkScope. These monthly rankings are updated every time a tournament is recorded in the SharkScope database, providing users with up-to-the-minute ranking accuracy. The “Leaderboards” tab in the player section shows that player’s rankings in the 5 most popular tournament types they have played, in addition to the number of players who have played that tournament type and what fraction of those are profitable. (An example is shown below.) We hope these new leaderboard additions will provide a whole new dimension helping SharkScope’s users to track progress, set goals, and improve their games. SharkScope also adds more networks to our coverage. SharkScope expands it’s coverage again, adding Chico, Pokerdom & Europebet! Covering Chico brings a new dimension because it’s the only site we now cover that has it all plus Chinese Poker. Add to that the mostly Russian site PokerDom and that includes the Pineapple version of Chinese poker along with Hold Em. Lastly Europebet which is mostly Georgian and has great Hold Em action. We continue to strive to give you the most information in Online Poker!